Jamie Thomson grew up in Brighton where he met one of his co-authors Mark Smith at school at Brighton College. He graduated from the University of Kent with a degree in politics and government. 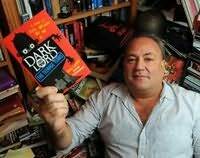 Jamie Thomson was an assistant editor on White Dwarf magazine from 1981 to 1984 and wrote a regular column for Warlock (magazine). While working at Games Workshop, he was one of the developers of the computer game The Tower of Despair.